The American Century navigates Lake Superior ice in the Duluth harbour as she takes on her final load of iron ore to close the 2018 Great Lakes shipping season. Long before the Welland Canal or the St. Lawrence Seaway’s opening in 1959, fur and timber trade vessels plied the waters of Lake Superior, sailing from its westernmost tip with their cargoes du jour. Arrival of the great bulk cargoes — coal, grain and iron ore — began supplanting fur and timber in 1871 after the United States Congress authorized inner-harbour improvements at the Twin Ports of Duluth and Superior for the first time. It had long been Mid-America’s gateway to the world, but the port’s growth accelerated rapidly after those advance­ments. Wheat and coal from the west poured into Duluth-Superior, followed soon by rich red ore from Minnesota’s Iron Range. In 1895, ore shipping tonnage surpassed coal for the first time at the Port of Duluth-Superior, topping out at a then-robust 1.6mt (million metric tonnes). Within a decade, it would jump to 14mt. By 1953, with American steel demand at its peak, the Port of Duluth-Superior shipped nearly 60mt of ore, becoming the largest ore-shipping port in the world. Six years later, when the Great Lakes St. Lawrence Seaway opened to the Atlantic Ocean, Duluth-Superior took an even more prominent place at the head of the Lakes, less than a week’s sailing time from the great salted seas. Today, Duluth-Superior shines as the largest tonnage port on the Great Lakes and one of the nation’s top 20. It truly is Mid-America’s bulk cargo capital and gateway to the world. The Adam E. Cornelius and Mesabi Miner await loads of iron ore at the CN/Duluth Dock on Lake Superior in Duluth, Minnesota. In 2018, nearly 20mt of ore shipped from the port, its highest total since 1995. That comprised approximately 60% of the port’s total tonnage. Coal, at more than 8mt, and limestone, at more than 3mt, rounded out its top three. Grain, as it has for nearly 150 years, also contributed significantly to the port’s business with more than 1mt shipped. Wheat led the way, followed by beet pulp pellets, canola, and for the first time in more than a decade, soybeans. The port also moved clay and a healthy helping of general cargo. Taking in the bigger picture, international shipping through the St. Lawrence Seaway, in and out of the Great Lakes as a whole, also had a strong season. Tonnage on the waterway in 2018 reached 40.9mt. 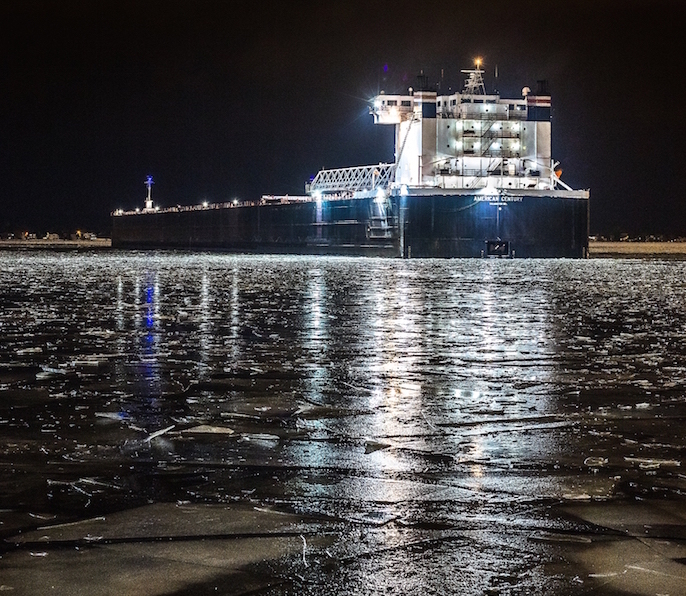 That, of course, is the challenge faced each year on the Seaway, which can accommodate only a ten-month inter­national shipping season due to ice on the cold-weather Great Lakes and closure of locks through which vessels make their 600ft inland climb from the ocean. Thanks to favourable ice conditions early in January 2018, the last 1,000ft lake carrier left Duluth-Superior with taconite pellets just two days before the Soo Locks closed on January 15. It capped a successful campaign on Minnesota and Wisconsin’s only deep-water international port, which is home to 20 private bulk cargo terminals and the Duluth Seaway Port Authority’s 120-acre Clure Public Marine Terminal. 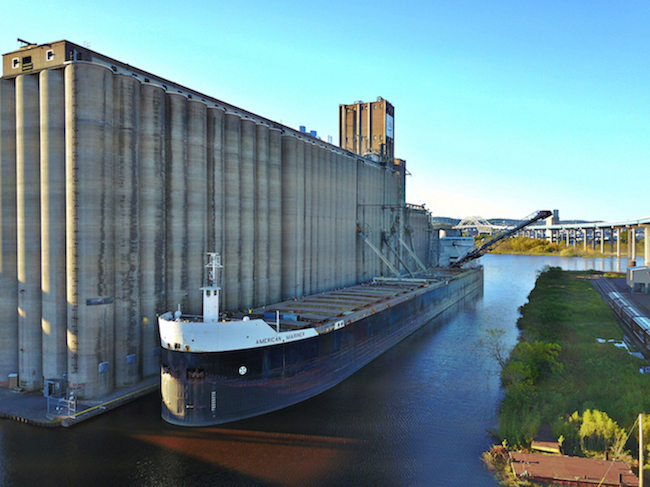 The American Mariner takes on a load of grain alongside the CHS elevator terminal in the Port of Duluth-Superior. As the port steams into 2019 and the St. Lawrence Seaway’s 60th anniversary, the outlook is once again promising. Demand for ore remains strong worldwide, incoming project cargoes dot the shipping calendar and grain exports will continue to help feed the world. Salt shipping could also rise after a long, cold winter in the north. Combined with the usual movement of limestone, coal and cement, it creates every hope that, when the locks close in January 2020, they’ll be closing another successful season on North America’s binational waterway.